April 1, 2011 - Enterprise Holdings, which owns and operates the largest fleet of rental cars in the world under the Alamo Rent A Car, National Car Rental, and Enterprise Rent-A-Car brands, announced it will end its relationship with Orbitz and its sister site CheapTickets after months of difficult discussions. "We are ending our negotiations with Orbitz following their decision to de-list National and Alamo, and insist on unacceptably high commission rates from our Enterprise brand," said Pam Nicholson, President and Chief Operating Officer of Enterprise Holdings. "Their position greatly limits consumer choice and makes renting a car less affordable. It is also punitive towards rental car brands that have contributed to Orbitz's success for many years." The Alamo and National brands have been listed on Orbitz since 2001. Enterprise Holdings -- which acquired Alamo and National in 2007 -- had been in negotiations to add its flagship brand to the Orbitz site when it was informed of Orbitz's decision to remove both National and Alamo, and accept only Enterprise. "Through our many decades of serving customers in this industry, we have learned it is difficult to fully meet the changing transportation needs of consumers with only one brand," said Nicholson. "As a result, following our purchase of Alamo and National almost four years ago, we consciously decided to maintain three separate rental car brands, each with a unique service offering." Alamo is a leisure brand known for offering discounts to deal-shopping customers. National is a brand preferred by business travelers and other frequent renters. 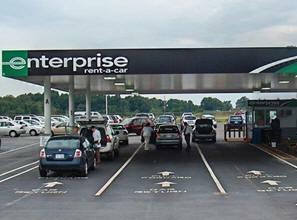 Enterprise -- the largest car rental brand in North America -- is available both on and off airport and has the largest network of locations in the industry. Across all three brands, Enterprise Holdings and its regional subsidiaries own and operate nearly one million vehicles, which constitute the world's largest fleet of passenger vehicles. "We realize our role as the industry leader comes with a responsibility to keep our product affordable and to aggressively advocate for the rights of consumers," Nicholson said. "For example, we lead our industry in the fight to curtail excise taxes that unfairly single out rental car customers. Today, rental car taxes account for as much as 20 percent of the cost in many markets, placing our industry's customers among the highest taxed in the United States." "These escalating taxes, combined with unacceptable commission costs imposed by third parties such as Orbitz, mean more and more consumers no longer will be able to afford to rent a vehicle," Nicholson said. "We believe the stance being taken by Orbitz violates the best interests of consumers, our company and our industry. While we would have preferred a different outcome, effective April 1, none of Enterprise Holdings' three brands will be listed on Orbitz or CheapTickets."